A ‘Mystery MG’ no more. OTW makes no apology for its continued search for the provenance and history of items that it features. No matter how nice a car, boat or engine is, it is just that, an object, with a certain value, but no more. Finding out who built it, where it has been and the story behind it brings it to life, and enhances the value immeasurably. It is not only the research that we carry out, but also the vast knowledge of the people that access the site that can often piece together a provenance or history, which we are happy to pass on for future reference. It is what OTW exists for in many ways and the subject of this article is a fine illustration. The story starts in an auction house up in the North West and a sale of diecast toys. The sort where a number 303 with the blue band on the box is worth 10 times more than if it has a red band! 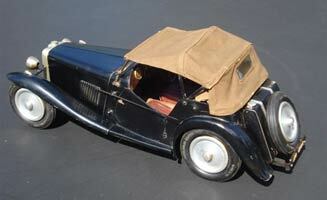 Normally this would not be of interest, but the last lot of the sale was a hand built model of an MG sports car. The brief description indicated that it had a motor and was some 20 inches long, which suggested it was not a toy and worth further investigation by the member of the Retro Club who had discovered it. 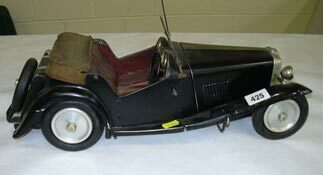 From photos sent by the auctioneers it was obvious that it was a very well made, scale model of a MG TC Midget, around 1/8th scale. Under the bonnet was a Mills 1.3cc diesel and clutch, and the two hooks on the side confirmed that it was a tether car. The rest of the photos confirmed the accuracy and quality of the model, but left the question as to how much it might make. Sometimes when it is an odd lot in a sale and at the end, there is not too much interest, and for the lucky RRC member on the end of the phone, this proved to be the case. Of course it was still unseen, but seemed a good buy in any case, but following its delivery it seemed even more of a good buy. Scale cars come into three main categories, those that only bear a passing resemblance to an original like the Cruickshank MG Magic Midget, which relies on the letters on the grill to give a clue. Those that are as near to scale as materials and intended usage will allow, and finally, the correct down to the last the last screw in the fuel injection metering valves versions as typified by Henri Baigent and Gerald Wingrove. 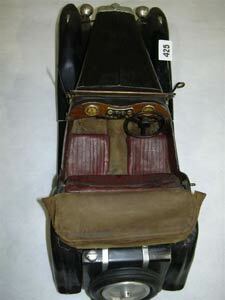 This MG was definitely at the top end of the middle category as the detailing included a folding hood and cover with press fasteners, all lights, radiator grill, badges, fully fitted and upholstered cockpit, with opening doors and correct handles, folding windscreen, and number plates, which were to prove significant. The concessions were made under the body and in the materials used in the construction. The 1066 wheels and tyres were of the correct size but far from the original wire wheels, while the chassis was a very simple wooden frame with solid axles. 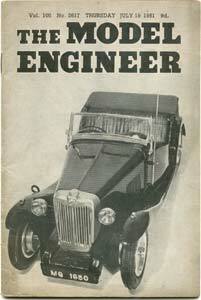 The Mills 1.3 was a MkI series 2, coupled to a home made clutch, driving the rear axle through open bevel gears. Here then was an exceptionally fine model, but without a clue as to who might have built it, and that did not seem right for something of this quality. So the quest began! The only information the auction house would give was that the car came from the estate of the late Mr Hancox, (note the spelling) from the Liverpool area. Peter Hill recalled someone with the same spelling racing tethered hydroplanes, but this was in an entirely different part of the country, so probably of no help. It was inconceivable that a car of this nature was not pictured somewhere, but where to start looking? The number plate of the car was 1950, which might be a pretty good indication of when it was built, but that was just the period that all the specialist magazines were closing. Nevertheless, a scan of all the available model car magazines and books did not reveal anything so it was necessary to look further a field. Model Maker had nothing obvious, so what about Model Engineer, which had started publishing a few car based articles after the closure of MCN? There now exists a database of the ME that includes every article and item ever published, with author, subject, page and volume number, so this might be of some help. Neither of the two volumes for 1950 produced anything, nor did the first half of 1951, but just into the second volume of 51, ‘bingo’! ‘A 1/8th Scale Model M.G. Midget’, author L.A. Hancox. Cross-referencing the issue number brought us to 19th July 1951, and there it was, featured as the cover photograph as well as in the editorial material. What is described in current terms as ‘a result’. Mr Hancox describes how he had been interested in scale model aircraft and boats for many years, but had ‘recently felt the urge to build a power driven model car’. 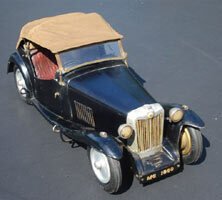 Having owned two MGs he decided on the TC Midget that was produced between 1945 and 1949, obtaining the required drawings directly from Morris Cars. The scale only came about as he had to reduce the original drawings in size and the new drawings worked out to just about 1/8th full size. The Mills 1.3 was chosen as he was ‘not interested in sheer speed’ with the choice of materials being dictated by his own capabilities and workshop facilities. With the exception of the metal mudguards, the rest of the car was to be wood. The mudguards were the first parts to be taken in hand, beaten up out of 22 swg brass sheet over wooden formers. Hancox reckoned these to be the worst job of the entire build and that he was filled with ‘great fear and trepidation’ over his first attempt at ‘metal bashing’. Considering that the four wings are handed pairs and very different front to rear, as well as having the correct ribbing, then this was a pretty spectacular ‘first attempt’. The chassis was cut from ¼ ply with the ball races for the front axle held captive in the frames and the rear races in housings screwed to the frames. 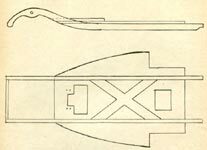 The Mills motor was mounted on ply mountings and was fitted with two exhausts on a manifold that used the cylinder screws to hold it down. The exhaust then curved towards the front of the car and under the chassis. One was continued to the rear to exit as the real exhaust, while the other was cut off just before the rear axle. A twin shoe centrifugal clutch was made with a steel flywheel, dural housing and Capasco shoes. 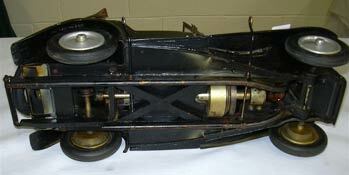 The drive shaft was supported in the chassis cross members and turned the rear axle via the 2:1 open steel bevels. The body was built up from varying thicknesses of ply; with the entire rear half of the body in one piece so that it could be lifted from the chassis as a single assembly. The bonnet and radiator grill are again built up and carefully shaped from ply, with the grill being pierced to allow for cooling the engine. 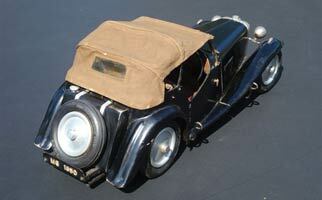 The bonnet comes off to allow for starting the engine and then snaps into place. The cockpit and dashboard were as near to scale as was possible, with all instruments and switches machined up on an old 2¼" Adams lathe. All the lights are present, and remarkably, the headlights are working, with miniature bulbs fitted that run off a 3v battery hidden behind the seats. The attention to detail is incredible, with the dummy fuel tank being held on by metal straps and having a Le Mans type filler cap, while a 1066 wheel and tyre was fitted to the tank as the spare. Number plates utilised lead pattern makers letter and numbers, but to my mind the most amazing features are the upholstery of the seats and the working hood, with its cover. The seats are ply with Sorbo rubber pads that were then covered in red leather, ‘tooled’ with the back of a hot kitchen knife. The khaki twill hood folds down on metal stays and has its own cover, again in twill, all held in position with scale clips and snap fasteners. The radio aerial is more than a dummy, as it serves as a ‘knock off’, being connected to the original Mills cut off on top of the tank. With the construction of the car complete it was down to finishing, but before being stripped down and consigned to the ‘paint shop’ it was tested on a school playground using a portable anchor, and ran at between 25-30 mph. 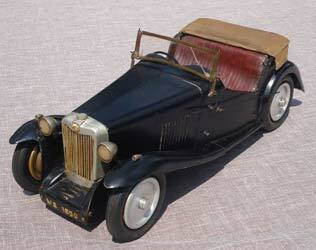 As Hancox stated, "Not fast by model car standards, but most realistic in appearance". There are no details given as to the painting other than that he used black cellulose for the body and silver for the radiator. All the metal parts were nickel plated, which was relatively common at that period, both on models and in full sized practice. 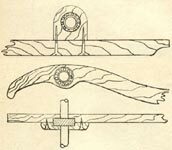 There is no doubt that it was a stunning model and a superb piece of work in all respects, and Hancox stated his intention to build replica spoked wheels, when it would be ‘hard to distinguish it from the real thing’. It was still in this state when it was displayed at the 1951 Model Engineer Exhibition; being mentioned in the ‘Things to see at the exhibition’ feature in the ME for Aug 31st 1951. The article bemoans the lack of cars in the class, but goes on to say. "Particularly noteworthy is the splendid finish which Mr Hancox has achieved in wood. 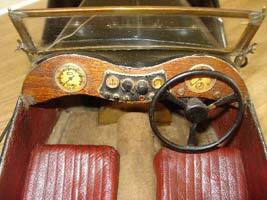 The only metalwork in the major assembly of the coachwork being the wings which were beaten from brass sheet". It goes on to describe the motor and drive system and then continues. "The hood works in the approved manner and the aerial has been craftily designed as the fuel knock off switch". 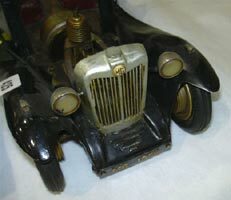 The MG was mentioned briefly in the October Model Maker review of cars at the exhibition, where it was described as ‘very fully detailed’, and patronisingly as ‘an excellent amateur effort’. Fifty eight years on, it is apparent that Mr Hancox never got round to making the spoked wheels, and that the car did not do too much running after it had been painted. Leslie Hancox left Esmond gardens in Chiswick for Liverpool at some stage, taking the car with him. He retained it through to his death in 2004 at the grand age of 98, which explains how the car came to be in the auction in the first place and brings us right back to the start of the story. When the car was delivered to its new owner, the general condition was excellent, although the hood is a bit delicate. In order to get the tonneau cover and soft-top back to fitting its original shape, a couple of new fasteners were required. Having found the right size to replace the missing ones, and spot on thread colour, some tan thread was marinated over night in a secret brew of PG Tips and Nescafe instant coffee. Other than this, and a bit of attention to the cut off and lights, a gentle clean and polish will have the car back to pristine condition. 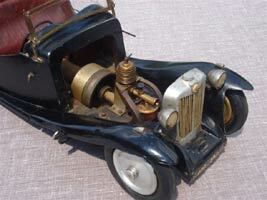 So not only has a very observant and lucky member of the Retro Club found himself with one of the best scale model cars that has come onto the market in a very long while, but thanks to some dogged research by a fellow RRC member, has been provided with a history and provenance as well. Excellent news for him and a most satisfactory result for OTW who have been able bring you the entire story of the car. It does beg the question as to whether there are any other soft-top tether cars out there?